Do you find it challenging to create explainer videos and looking for easy to use tool which can help you produce exceptional as well as professional animation videos? Are you tired of complicated softwares such as Adobe Premiere for editing? Or want to create explainer videos within few minutes than spending hours? If so then let me introduce mysimpleshow – the most powerful, convenient, and simple to use web-based software built for students, teachers, marketers, and individuals. Its sophisticated explainer engine automatically makes a storyboard for your entered script, and surprisingly it takes only a few minutes. Even newbies having necessary skills can create their first animated explainer video. Before starting this mysimpleshow review, let me share a little bit about the software and company behind. mysimpleshow platform is developed by “SimpleShow” team having 9 years of experience in explainer videos creation. They designed it for all level of users ranging from beginner to advanced with a simple yet scientifically proven methodology to simplified everything from storytelling to finalization phase along with examples and tutorials for easy understanding. Its powerful engine just required basic information about your project and script which you can also upload through PowerPoint file. It’ll extract all the text from the file which you can adjust as per requirement later. Then it suggests visuals based on keywords from the script you provide. With flexible customization feature, the user can edit, re-arrange, or add own images to make awesome explainer videos within minutes. Almost everyone can take benefits from mysimpleshow software more precisely people in the eLearning, Business training and learning fields, HR Professionals, startups can utilize it to create presentations for compelling explanation in movie format rather than old sliding method. Any complicated theory or educational data can on a yearly basis with the help of this tool for better understanding. Marketers and advertisers can use to explain their products benefits, how to use guides as well as marketing campaigns for improved ROI. You may know that video marketing is way better than static or text ads. So, make use of this software and boost your revenue. Is there Any Learning Curve? No – if you’re using computer and internet for a while, I don’t think you’ll need any guidelines. It’s way simpler than any video editing software available in the market, and that’s why they are an industry leader in explainer videos. It takes few minutes, probably less than 2 minutes to get familiar with. In a nutshell, no serious learning curve or expertise required to use mysimpleshow. Still, if you need further help, contact them via email or browse FAQ section. For your convenience, follow my step-by-step beginner guide to start building your very first project. Before getting started, click here and sign up for your new mysimpleshow account. There are three ways to create a new account such as Facebook, Google, or email address. Provide the mandatory information and click on “Make a video for free” button. Check your email account and activate the account, it’s essential to get started. 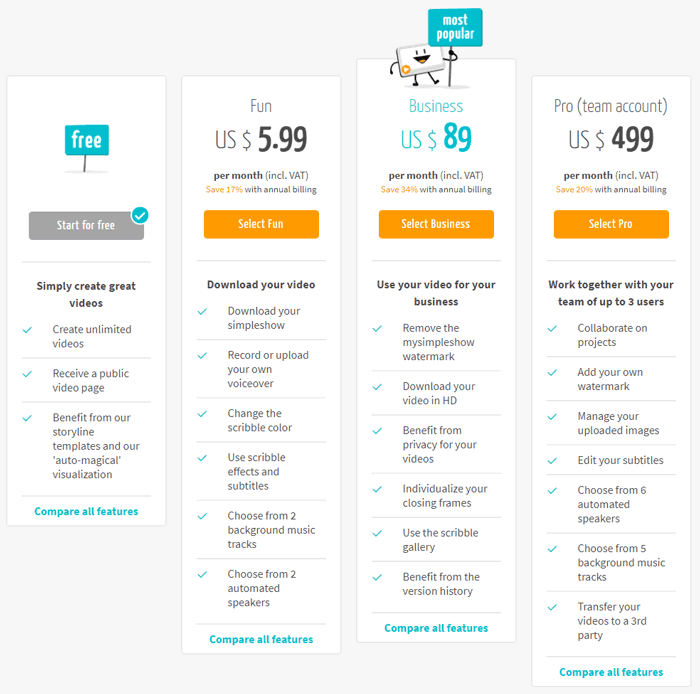 You can also upgrade your free account to paid options with additional premium features under Business and Pro plans. Login to your newly created account and click on “Create New Video.” The editing process consists of 4 simple to follow steps for creating explainer videos. As you can see below, there is a video named “Test Project” that I have created to check the functionalities and capabilities of this tool. All of your previous projects will show here. You can short them in different orders like draft, write, visualize, and finalize, etc. Step 1: Now we’re at first phase, “Draft”. Here pick appropriate storyline for your project from 3 major categories; Professional, Educational, and Personal. Go with the most suitable one, if your chosen one doesn’t meet the requirements, just navigate to back and re-pick. mysimpleshow comes with dozens of storyline templates to fulfill everyone’s need. Note: You’ll be guided via pop-up video tutorials and examples located in the right sidebar throughout the process. Newbies must watch each tutorial at least once for better understanding. Step 2: At seconds phase “Write”, type your script. It’s divided into different section such as Title, Intro, Summary, Call to action, Result, etc. Each template comes with different sections. Type the relevant information in each section and then click on “Choose visuals” button. Keep in mind, for beautiful and professional explainer videos you must have a great script. It also helps mysimpleshow’s explainer engine to create stunning animations. Step 3: After clicking, the explainer engine will automatically craft a storyboard for your provided script. It’s the main beauty of mysimpleshow movie maker software. Based on keywords from the storyline (script) you provide, it’ll suggest visuals. Each section attains separate graphics/visuals to make editing process easy and allow a maximum of 7 picture in one section. You can re-arrange or change images, upload your own photos, or color them for engaging video. Replace irrelative graphics with suitable ones. There are also various closing frame options available to choose from in this step. When done, click on “Choose audio” located at the bottom. Step 4: Now at final phase “Finalize”, you’ve to choose voiceover which will play while watching the video. There are multiple voices options available in male and female tune. You also can record own voiceover or upload. However, free version restricted to one male voice. So, for other voices or own audio, you’ve to buy a premium plan. When done everything, hit “Finalize video” button, set up privacy setting and video quality. The finalize stage also contain other settings like speed adjustment, watermark, voiceover selection, adding brand logo, custom color schemes, custom background music, subtitles, etc. But, all of these features available for premium account holders only. As a free user, your explainer videos will be available for public access. That’s it, you’ve done everything from your side, and mysimpleshow platform will finalize your project within next few minutes and notify via an email. If something looks ugly just edit the video, it’s dead simple. Plans and Pricing: Which One is Right for You? Besides the free plan, you can choose from 3 different premium plans and for enterprise level access or educational purpose, just contact them. The free version allows you make unlimited videos and social media sharing but comes with restrictions. Buying any paid plan on yearly basis save you significant bucks and there is a major pricing difference between monthly and yearly subscription. So, if you’re satisfied with the service quality, then the annual plan should be your top priority. For more details about features and pricing structure, please check the image below or click here. In my judgment, if you want to get the maximum outcome of this platform, choose “Business” plan as it’s the most popular among other plans. It also includes watermark removal, HD quality downloading, privacy protection, scribble gallery, and much more. Video editing is time consuming and tedious job to come up with a unique and impressive graphics. It requires advanced skills and experience to use editing software as mentioned earlier (Adobe Premiere Pro) to build explainer videos. But luckily now you’ve mysimpleshow to produce the same videos within few minutes in HD quality. I recommend trying the free version first before buying paid one to check if it’s worth your money. The free account offers enough features and functionalities to test the service quality. If found useful, just go for a premium plan. And please give me a favor by sharing this mysimpleshow review on social media and let me know your thoughts in the comments section below.